After doing a shakedown hike a few months out from my 2016 Larapinta Trail trip I decided that my 70 litre pack (that is the recommended minimum size for the Trail) was overkill particularly given it was only about 70% full. With my aim to become an ultralight backpacker over the next few years, I decided to bite the bullet and go for one of the growing number of lightweight packs and as I tend to be a try before I buy kinda guy, I opted for the readily available Osprey Exos 48 pack (in size large this is a 51 later pack). In my first attempt at setting up this pack I managed to get all my equipment (including four days of food and three litres of water) into the pack but I felt that I was pushing the friendship a bit. Two more repacks and a readjust on how I was packing, saw me comfortably fit all my equipment at a full loaded weight of 14.7 kg (32 lbs). Hardly ultralight but definitely with base weight in the lightweight category. 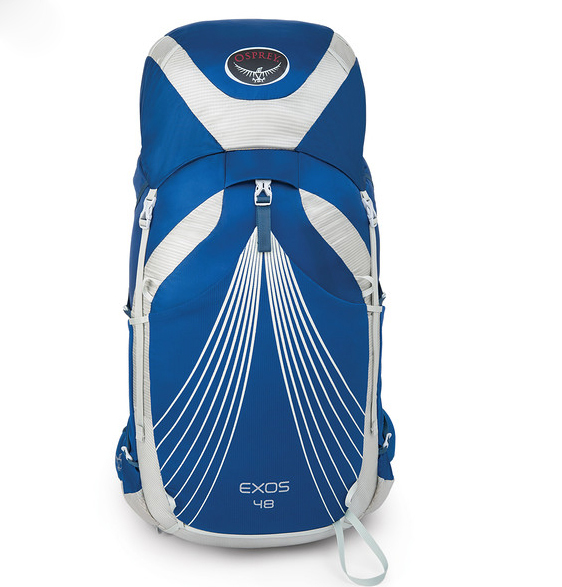 I have always been a fan of trampoline type pack suspension and the Exos is no exception. 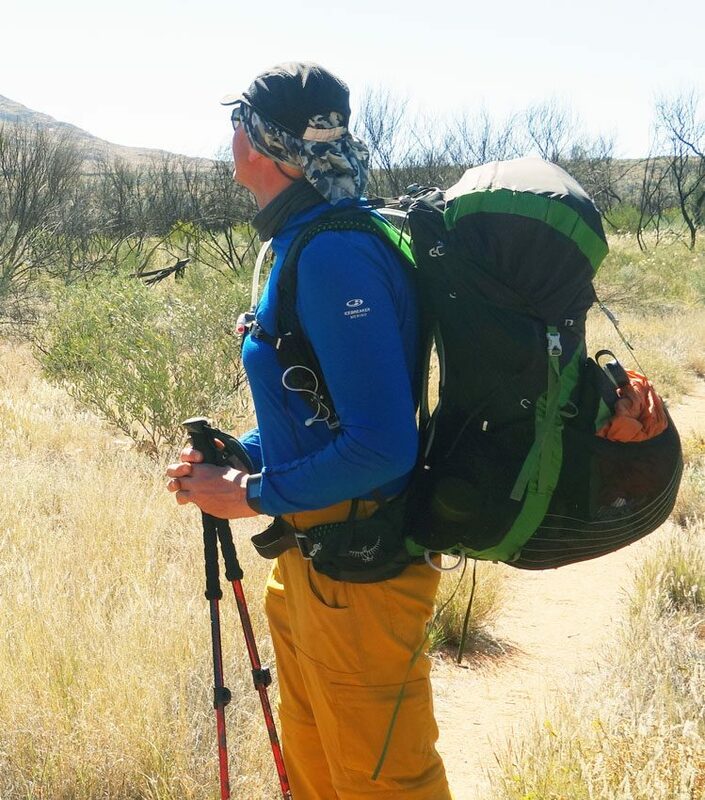 I found the pack carried my loads which varied between 10 kg (22 lbs) – 21.3 kg (47 lbs) comfortably and even at the heavier end of the range at no stage did the shoulder straps cut in to me. On the few days that saw the temperature reached approximately 32° celcius (90°F) my back remained sweat free. 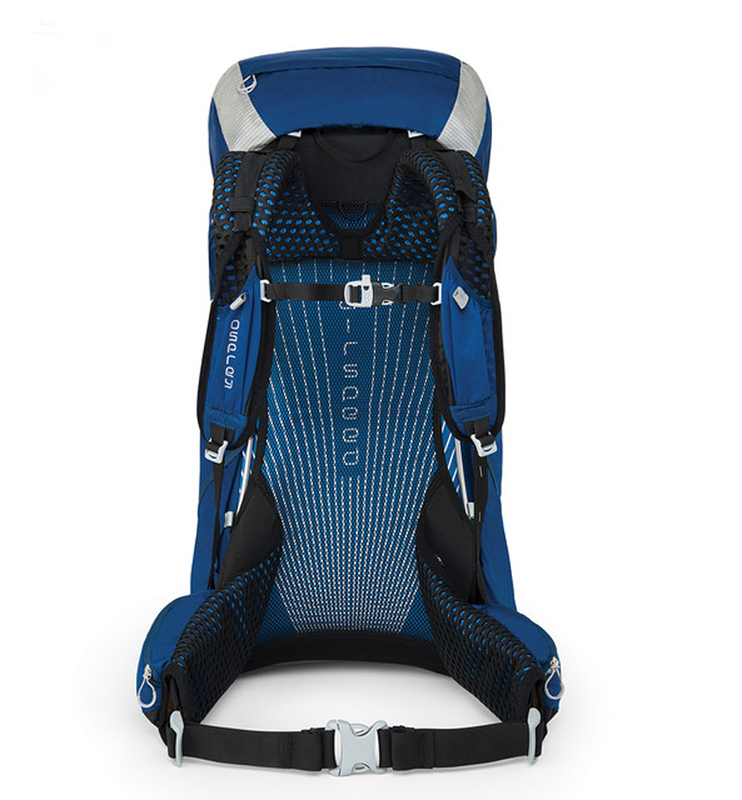 One of the unique features of this pack is the removable ‘pack brain’ which allows the weight to be reduced even further but with a loss of six litres capacity. I’m a big fan of using the ‘brain’ and store my electronics, snacks and valuable for easy access so am unlikely to ever travel sans brain. This pack has no shortage of pockets. 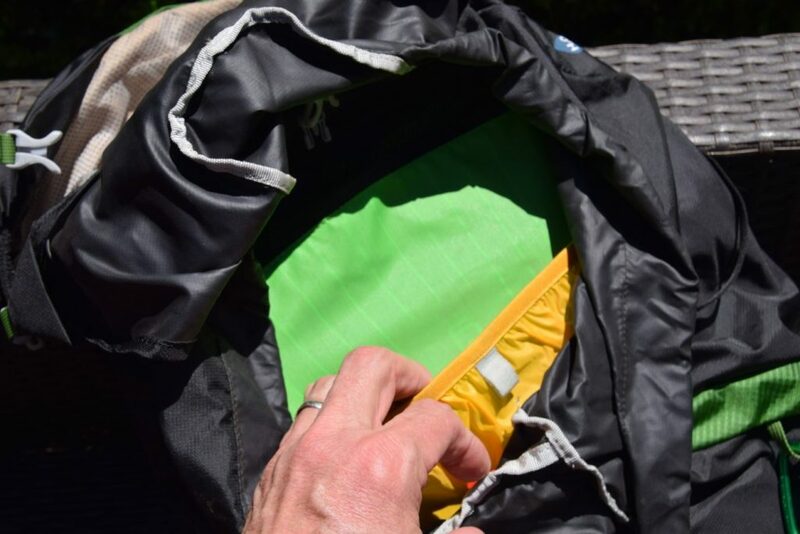 The large stretchy pocket on the back is ideal for holding the tent and other flexible material but it tends to make the pack look ‘pregnant’ as seen in the photos below. 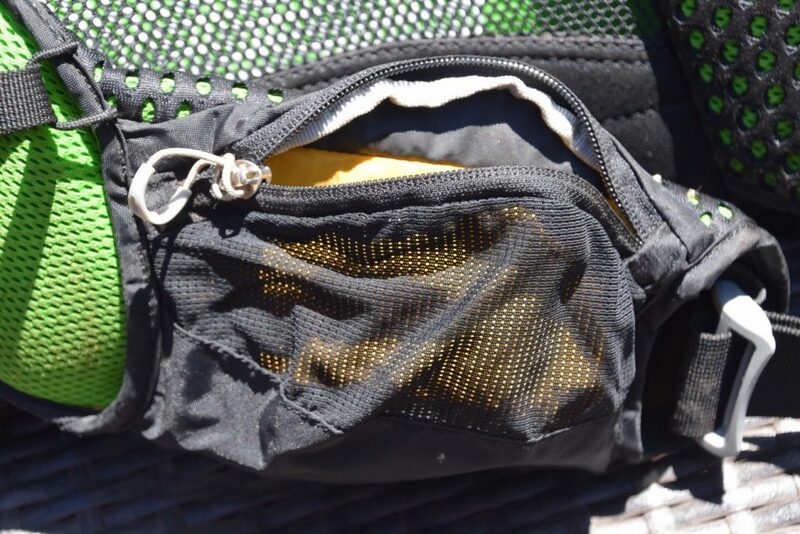 The two side pockets hold typical Nalgene style water bottles or other similar sized equipment. The two shoulder strap pockets are ideal for things like hand sanitiser and cliff bars, and the waist pockets are also ideal for snacks and other small bits and pieces. However, I think that these waist belt pockets are one of the negatives of this pack with many of the Exos’ competitors are opting for large pockets that allow more flexibility in packing. The other main feature of this pack is the internal water bladder storage that requires the removal of equipment from the main compartment to reload the bladder. While this still tends to be an industry standard I have been spoiled by my larger Osprey pack which has an external bladder pocket. The other down side is the lightweight material and while it reduces the pack weight it also means you can’t throw this pack around like you can with the traditional heavy weight packs we have been using for many years. Overall I think this is an excellent pack and it is easy to overlook the few shortcomings. I’ve only owned this pack for just over four months now and it has fast become my favourite pack.